Registrants will be able to download book and stream session files immediately after payment is processed. 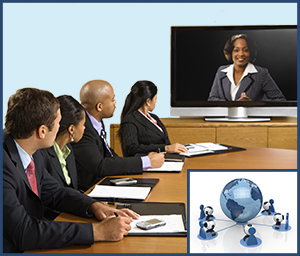 Facilitating Remote and Online Meetings – Essential Success Skills provides a practical model and extensive toolkit for designing and facilitating online meetings. This course offers specific strategies you can use immediately to create a participatory environment where all attendees are providing ideas, remaining engaged, and contributing to the meeting’s success. Attendees will learn how to merge their existing facilitation skills with online technology to manage meetings effectively even when you cannot get people together in the same room. If you have a geographically dispersed audience but need greater collaboration and teamwork, this course is for you. If your job is facilitating groups but travel problems get in the way, this course is for you. If you already have a lot of online meetings but are not satisfied with their productivity, this course is for you. All attendees will receive prepared material, demonstrations of online facilitation techniques and tools, and access to resources you can use after the course. Design and implement a facilitation that is appropriate for the online environment. Pick and use the online meeting support tools that are a best fit for the purpose of your meeting. Manage the group discussion and teamwork to ensure forward momentum to arrive at a definitive closure. Manage participation to keep everyone engaged and ‘on task’. Adapt face-to-face techniques with appropriate online techniques and technology. Collecting feedback from remote participants. Managing people when you can’t see non-verbal cues. Bringing the online meeting to closure and getting a clear decision. Attendees will receive a PDF of workshop proceedings and reference material.